We just released a major update that includes, among other things, our first attempt at inquiry management and tracking. The next time you login, you'll notice a shiny new menu called "Inquiries". 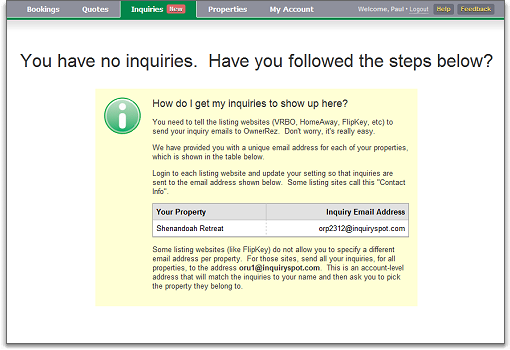 Click on it, and you'll see an instructional page that talks about routing inquiries into the system. Over the next few days and weeks, I'll be discussing all of the new inquiry features, how they work, answering some of your questions and talking about the future of inquiry management. From the very first moment I started getting inquiries from listing sites I always wondered which site gave me the best ROI. VRBO sends a lot of inquiries, but do those inquiries convert into bookings as well as inquires from Vacation Home Rentals? If so, who's better and how much better? This new inquiry tracking will allow us to generate reports and charts that answer these questions in future updates. Inquiries management and tracking has really been an exciting area for us to work in. We have a lot of great ideas, and we're already hard at work on the second pass. This is nice - two questions. Is there a way to edit the standard inquiry response? Also can you view the email that was sent as part of the response. Is there a way to edit the standard inquiry response? Absolutely. The "answer" page looks very similar to the email page for quotes. You can edit every part of the response including the subject, body and even the to name/email address. By default, we supply a standard template message (just like with quote email) for various scenarios. Thanks for your inquiry. Unfortunately, those dates are already taken. Are you able to move your dates at all? Again, you are free to edit this before sending. We are planning on adding a lot of email options in upcoming sprints so that you can define your own email templates with rich text, mail merge fields and tracking. Also can you view the email that was sent as part of the response. Yes. As with quote email, there is a "Send me a copy" check box that is selected by default. Sam will be blogging about all this in detail over the next few days.